Undercover At An Evangelical University Brown University student Kevin Roose passed himself off as an evangelical Christian to blend in with students at Liberty University — the school founded by the late Moral Majority leader Jerry Falwell. Kevin Roose outside his dormitory at Liberty University. Taking a semester off to travel and focus on writing isn't that unusual for a student at Brown University. But instead of studying comparative literature in Europe, Kevin Roose decided to go to Lynchburg, Va., and enroll at Jerry Falwell's Liberty University. Roose passed himself off as an evangelical Christian to blend in with students at the school founded by the late Moral Majority leader. 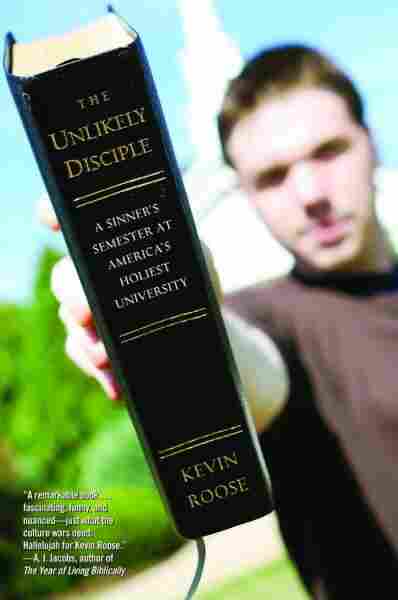 The experience led to a book, The Unlikely Disciple: A Sinner's Semester at America's Holiest University. Roose, the product of the "ultimate, secular, liberal upbringing," got the idea to go undercover after meeting a group of Liberty students while a freshman at Brown. "I had never really come into contact with conservative Christian culture," he says. "It became clear very quickly that we had almost no way to communicate with each other." He decided to investigate. "My goal was to see the real, unfiltered picture of life at Liberty University," he says. Even though his method required deception, Roose says the intent was honest. It "really did allow me to get a more accurate — and actually a fairer picture — of what life at Liberty was like." He enrolled in nearly every core class each Liberty student is required to take: Old Testament, New Testament, History of Life — a creationist biology course — and Evangelism 101, a course that instructs students on converting nonbelievers. Just converting to an evangelical student was awkward enough for Roose. One day he sat down to a test that featured a true-false question: "Noah's Ark was big enough to accommodate various species of dinosaurs." "I was sort of taken aback by that," Roose remembers, but says in general the classes were hard — and actually very informative. "I'm glad I took them," he says. Adjusting to dorm life at an evangelical university, however, was a special challenge. For starters, there's the 46-page code of conduct called the "Liberty Way," which outlines the rules and regulations of student life. "There's no drinking, no smoking, no R-rated movies," Roose says, "but also no dancing, no cursing and no hugs that last for longer than three seconds." Roose tried to follow all the rules, even buying a Christian self-help book to help him avoid cursing. For a couple weeks he walked around campus saying "Glory be!" and "Mercy!" Turns out Liberty students don't actually talk like that, Roose reports. "They would look at me like, 'Who is this guy, and what strange, isolated home school did he come from?'" Roose laughs. Fellow students knew Roose had transferred from Brown, but few suspected his secular background — and none knew he was writing a book. Once the semester was over, he had to come clean with his new friends. "It was one of the hardest things I had ever done, because these had become some of my best friends," Roose says. He expected them to feel betrayed — and expected to do a lot of apologizing. Instead, he says, something amazing happened. "Everyone forgave me — immediately," he says. "It was unreal how quickly their surprise turned to real compassion and excitement." "They were all excited about the book and excited that I had given Liberty a fair look, and an open-minded look — instead of just doing a drive-by article." But there was just a little disappointment. "They thought, given the semester with me, that they would have done a better job of converting me," Roose says. They may have done a better job than they thought. Even though he's back at Brown, Roose still tries to pray every day. He says the act of prayer changes him, referring to the writings of Christian author Oswald Chambers. "He said that it's not so much that prayer changes things as that prayer changes me — and then I change things," Roose says. "That's going to be important for me — to sit down every day and think about the problems and the challenges facing other people in my life, and really trying to increase my own compassion that way."